The CGA organizes an online tournament each year. It is played on KGS in the Canadian Room, and runs 6 rounds. Top Canadian players participate in it. Here is the game of the 5th round between amateur players Juyong Koh 7d (Canadian6d) and Fan Jun 7d (fun66). Juyong Koh ranked number 2 and Fan Jun number 4 in Top Canadian Go players. 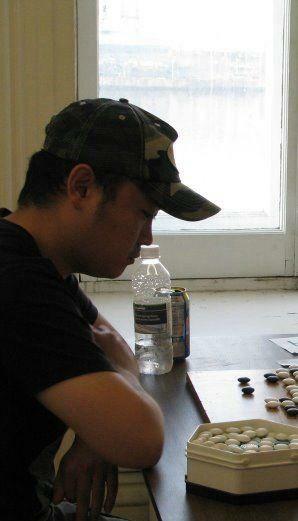 Juyong Koh played a few rated games on kgs defeating mouton112 8d, zchen 8d and chunga 8d. Though there were only around 20 observers it was a slow and high quality tournament game. I believe both players can easily reach KGS 8d-9d level. This is Juyong Koh's 5th victory in the tournament and his next game will be very exciting against Yongfei Ge 7d (gyfcat) for the 1st place in the tournament. Don't miss it! Actually, Juyong Ko has several 9d accounts on KGS. He doesnt play regularly on KGS, but if he did, I think he would be in the top 5.